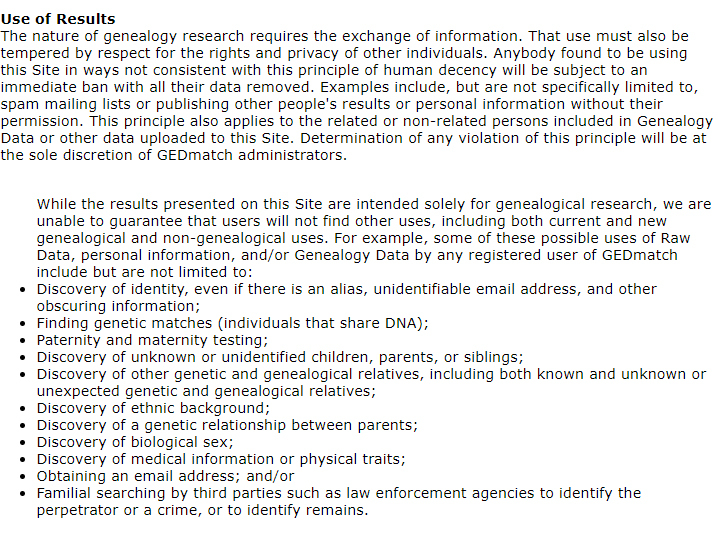 I agree that GEDmatch are more straight and clear about the use by LE agencies. But I still see problems with GDPR since the terms of services don't comply to GDPR. Then the service risks suit and fine from EU (yet to see). The purpose of GEDmatch is being a *genealogical* database with a clear objective - finding you relatives, to facilitate the genealogical research, be an open sharing community. It is not states as a purpose "LE agency DNA database". GDPR is about a user to have control over the data, in this case a very sensitive data that is prohibited to process unless the user explicitly agrees to such processing. GDPR requires (1) that the consent is given freely, (2) the consent is given explicitly for each processing purpose, (3) user has the right to prohibit some processing. (1) Giving the consent freely means that access to the service could't be conditioned to accepting all processing purposes. The user could be interested in the service, but not in receiving newsletters or promotions. According to the GDPR the user has the right to not agree with signing up for the newsletter and still use the service (the main point of interest for the user). 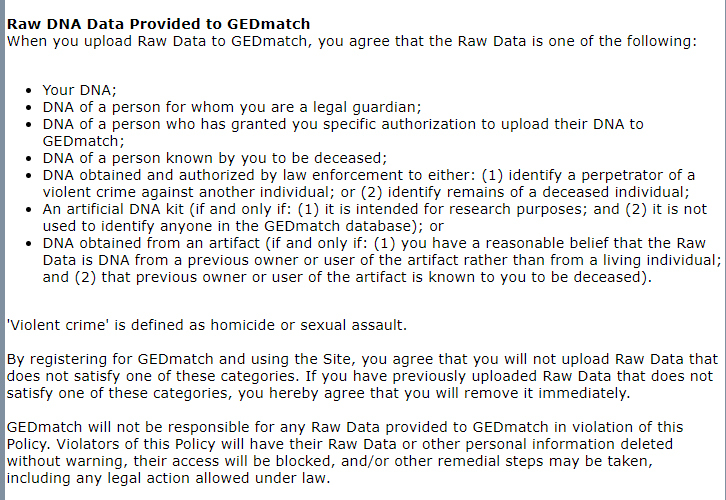 The use of GEDmatch couldn't be conditioned to accepting LE searches, since it is not the purpose of GEDmatch and the user has to right to opt out such processing of the personal data. (2) Explicit consent for each purpose. 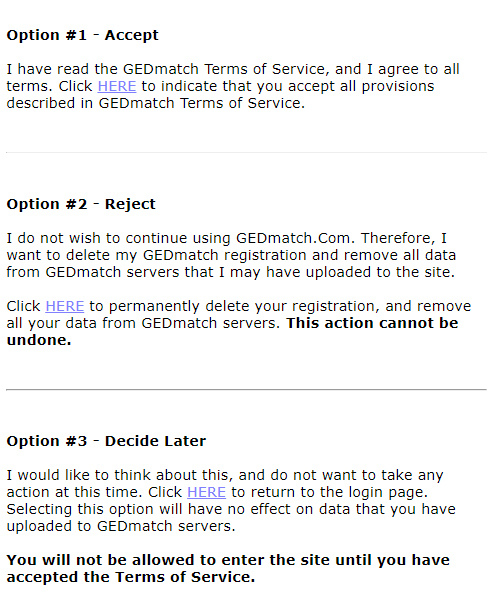 (iv) displaying uploaded GEDcomm:s to the matches or making them fully public. This list should include a item for explicit consent to use genetic data by LE agencies. None of the items, except the first one, is necessary och could condition the use of the (genealogical) service. According to GDPR the user has the right to prohibit some kinds of data processing if the processing is unlawful. 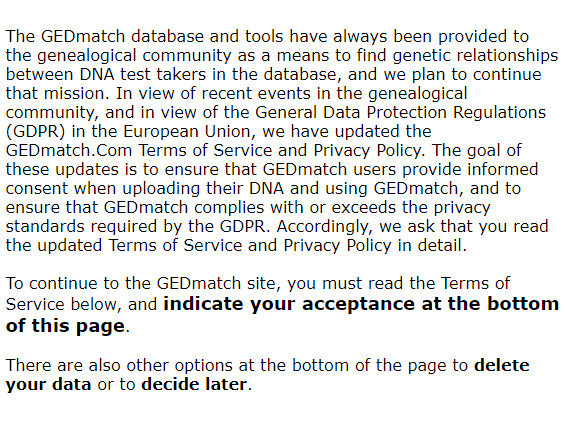 If GEDmatch doesn't allow the user to opt out, then they will probably be sitting with some EU customers that have the right to use the service and can demand that their data is not processed by LE. Posting a comment again. You have many good questions, one can write a book or a research about each. I think we can learn from the community developing Open Source software and their different licenses - GPL, LGPL, ASL (Apache Software License), BSD license and so on. Not to forget Creative Commons license. So releasing the genomic data could licensed - it is indeed the DNA tester that should have control over how this data is used. Lets imagine - you are fully ok with releasing your genomic data publicly and approve all possible uses in the present and in the future, the release it under "Fully Open Genome Data Public License". If you are ok with only genealogical research, then you can release it under "Restricted Genealogical Research Genome Genome Data License". Do you want to give access to your genomic data to the scientists and genealogists, release it under "Limited ... License". I think it is the possibility to enforce some privacy conditions. And I would like to see the genealogical community developing such licenses - a contract between a tester releasing the data and the public. The tester should have the control over data, not a web site, not an unknown LE agency. Every one in our community should have an option to contribute and have a choice how to contribute. Thanks William. You raise some interesting points. There would need to be a dedicated website that would allow genetic genealogists to upload their data and control the licensing. Doesn't https://opensnp.org/ already allow users to license their genomic data? However, even with open licences there is still the potential for misuse. I contributed some data to a Wiki. Another genealogist plagiarised my content and passed it off as their own without crediting the source. These infringements are difficult to enforce and patrol. Thanks Debbie! As I see opensnp.org offers only only one possibility - you give away your genotype, anything could be done with it. But it should be one of possible alternatives. Well, I understand your situation with the Wiki. Yes, it is hard to enforce and patrol for an individual. Well, now I will sound as a freak, but... with such a genomic licenses we probably don't need to be so proactive. Think a case where the attorney of a suspect learns that dna search was performed on "The Very Restricted Genomic License"-data. All evidences are considered illegal, the case is closed and the suspect goes free. Such possibility should push back LE agencies. These are intriguing possibilities! ISOGG is a rather strange sort of organisation because it doesn't charge membership fees and therefore it doesn't have any money. The advantage of not having money is that you can't be sued or fined, but it also means that ISOGG would not be a position to seek legal advice. I suspect that in practice it would be difficult to license an individual genome but this could perhaps be done collectively on a collaborative website. It would certainly be interesting if a foreign government were to be fined for breaching the privacy of EU citizens! 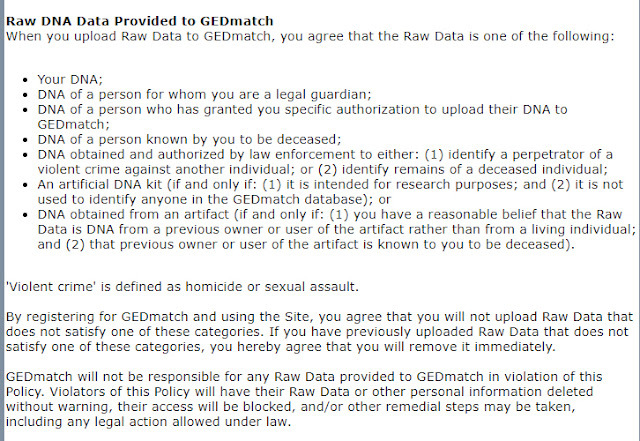 The two GEDmatch cases have yet to go to court so it will be interesting to see how the leads generated from GEDmatch searches will be interpreted and if the methodology will be considered valid and legal. Bizarre is right! And I wonder if any perpetrators are learning about this and buying one-way tickets out of the country before changing their name?